LEGISLATIVE UPDATE, April 1, 2019 | Nebraska Agri-Business Association, Inc. 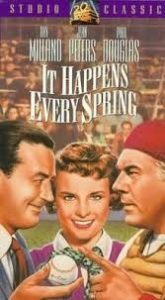 In the 1949 comedy, “It Happens Every Spring”, a college professor (Ray Milland) accidentally discovers a fluid that when wiped on an object (like a baseball) is repelled by wood (a bat). The Prof takes leave from the university to pitch in the Big’s. Cute story. Cute ending. Total fabrication. Something else happens every spring. The Unicameral has been in session for three months. Committee hearings for every bill introduced are complete. Priority bills have been identified, and full-day floor debate begins (Tuesday). Unlike the movie, not everyone in the Legislature will have a happy ending. Each of the 49 senators represent 37,000 constituents. Priorities vary from district to district. Priorities vary from senator to senator. Some senators are effective negotiators. Some are not. Some senators are convincing orators. Some are not. Some senators have egos….scratch that, all senators have egos. Last week, several bills were filibustered on General File. Senators picked sides, like in dodgeball, and talked until time expired. The bills did not advance. Feelings were hurt. Threats were made. Promises unkept. Twenty days until the budget. Forty days in the session.